Kampala, the largest city of Uganda, became that nation's capital city when it gained independence from Britain in 1962. The city is coterminous with the District of Kampala. It is located in Buganda, which is the kingdom of the Baganda people, the largest of the traditional kingdoms in present-day Uganda. Beginning with the end of colonialism, Uganda had suffered an era of coups and counter-coups in a struggle for power that involved the traditional king of Buganda and various rival factions. In 1971, the government was toppled by a military general, Idi Amin Dada who declared himself president, dissolved the parliament, and amended the constitution to give himself absolute power. Amin's eight-year term has been described as a reign of terror during which the country was decimated. Yoweri Museveni became president in 1986. Museveni brought relative stability and economic growth, although his presidency included involvement in the civil war in the Democratic Republic of Congo and other conflicts in the Great Lakes region, as well as the civil war against the Lord's Resistance Army. During 1990 - 2001, the economy grew because of continued investment in the rehabilitation of infrastructure, improved incentives for production and exports, reduced inflation, gradually improved domestic security, and the return of exiled Indian-Ugandan entrepreneurs. International debt relief totaling two billion dollars was extended in the early years of the twenty-first century. These factors have contributed to Kampala being largely rebuilt since the civil war, with construction of hotels, banks, shopping malls, educational institutions, and hospitals. The name Kampala derives from the British name for the area, "the hills of the Impala." Translated to Luganda it became "kasozi ka Impala." With time, local usage took to referring to the hunting expeditions of Kabaka, the King of Buganda, as Kabaka agenze e ka´empala ("The Kabaka has gone to Ka'mpala"). Eventually the hills became known as Kampala. Kampala occupies a series of hills at an elevation of about 3,900 feet (1,190 meters) and is located in the south of the country, north of Lake Victoria. Kampala enjoys a mild equable climate due to its altitude and the cooling breezes from the mountains, even though it is located a little north of the equator. The average maximum daytime temperature in January is 82°F (28°C), dropping to an average maximum of around 77°F (25°C) in July. There are two distinct rainy seasons. The first is during the months of March and May, and the second during the months of September and November. Mean annual precipitation is 46.22 inches (1174 mm). Kampala is said to be built on seven hills. 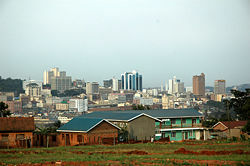 A view of suburban Kampala. The little hill of Kampala, from which the city got its name, is the location where Frederick Lugard constructed a fort for the British East Africa Company in 1890. In 2003, the ruins were destroyed to make way for a 15,000-seat mosque. Kasubi Hill is where the Kasubi Tombs are located. Mengo Hill where the Kabaka's Palace is and the headquarters of the Buganda Court of Justice. Kibuli Hill is home to the Kibuli Mosque. Namirembe Hill has the Namirembe Protestant Cathedral. Rubaga Hill, where the Rubaga Catholic Cathedral is. Nsambya was the Headquarters of the Mill Hill Mission. It now houses Nsambya Hospital. The city spreads to Nakasero Hill where the administrative center and the wealthiest residential area are. Tank Hill has a water tank, Mulago Hill has Mulago Hospital, the largest hospital in Uganda, and Makerere Hill is where Makerere University is situated. The city continues to expand along both sides of the Makindye Hill and Konge Hill. 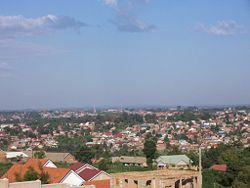 Suburbs include Kololo in the East on Kololo Hill the highest hill, home to the Uganda Museum; Namirembe; Kibuli; Kabalagala; Rubaga; Ntinda; Najjera; Kisassi; Nateete; Kireka; Namugongo; and Najjanakumbi, among others. 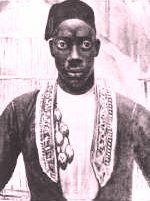 Mutesa I of Buganda was Kabaka from October 1856 until his death in 1884. Kampala in the early 1950s. The earliest human inhabitants of the area that became Uganda were hunter-gathers, remnants of whom are to be found among the pygmies in western Uganda. From 2,000 to 1,500 years ago, Bantu speaking people from central and western Africa migrated and occupied most of the southern parts of the country. They brought agriculture, ironworking skills, and new ideas of social and political organization. Nilotic people, including Luo and Ateker entered the area from the north probably beginning about 100 C.E. By the fifteenth or sixteenth century, centralized kingdoms, including the kingdoms of Buganda, Bunyoro-Kitara, and Ankole, had developed. Arab traders arrived from the Indian Ocean coast of East Africa in the 1830s, and found several kingdoms with well-developed political institutions. In the 1860s, British explorers searching for the source of the Nile River arrived. Protestant missionaries entered the country in 1877, followed by Catholic missionaries in 1879. Before the arrival of the British, Mutesa I (1837–1884) the Kabaka (king) of Buganda had chosen the area that was to become Kampala as one of his favorite hunting grounds. The area was made up of numerous rolling hills and lush wetlands, and was an ideal breeding ground for various game, particularly a species of antelope, the impala. In 1888, control of the emerging British "sphere of interest" in East Africa was assigned by royal charter to the Imperial British East Africa Company. 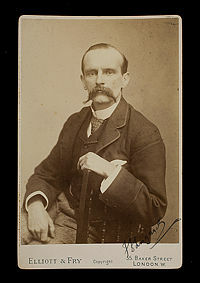 In 1890, Frederick Lugard constructed a fort for the British East Africa Company on the little hill of Kampala. The town grew up around that fort. The high cost of occupying the territory caused the company to withdraw in 1893, and its administrative functions were taken over by a British commissioner. 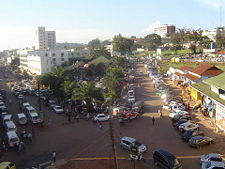 The city grew as the capital of the Buganda kingdom. The name Uganda, the Swahili term for Buganda, was adopted by British officials in 1894 when they established the Uganda Protectorate, centered in Buganda. Britain granted independence to Uganda in 1962, with the first elections held on March 1 of that year. Benedicto Kiwanuka (1922-1972) of the Democratic Party became the first prime minister. In that year, Kampala replaced Entebbe as the national capital. In February 1966, Prime Minister Milton Obote (1925–2005) suspended the constitution and assumed all government powers. In September 1967, a new constitution proclaimed Uganda a republic, gave the president even greater powers, and abolished the traditional kingdoms. 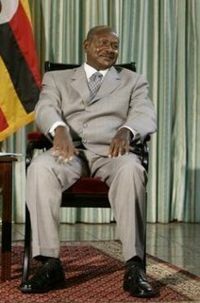 Yoweri Museveni, president since 1986. On January 25, 1971, Obote's government was ousted in a military coup led by armed forces commander Idi Amin Dada (1925–2003). Amin declared himself president, dissolved the parliament, and amended the constitution to give himself absolute power. Amin's eight-year rule produced economic decline, social disintegration, and massive human rights violations. The Acholi and Langi ethnic groups were particular objects of Amin's political persecution because they had supported Obote and made up a large part of the army. Amin forcibly removed the entrepreneurial Indian minority from Uganda, decimating the economy. In October 1978, Tanzanian armed forces repulsed an incursion of Amin's troops into Tanzanian territory. The Tanzanian army, backed by Ugandan exiles, waged a war of liberation against Amin's troops and the Libyan soldiers sent to help him. On April 11, 1979, Kampala was captured, and Amin fled with his remaining forces. Kampala was severely damaged in this war. In 1978, the International Commission of Jurists estimated that more than 100,000 Ugandans had been murdered during Amin's reign of terror. The Library of Congress places the estimate at 300,000. Obote returned to power, to be deposed in 1985 by General Tito Okello (1914-1996), who ruled for six months until he was deposed after the so called "bush war" by the National Resistance Army operating under the leadership of Yoweri Museveni (b. 1944), and various rebel groups. Museveni became the president of Uganda on January 29, 1986. In the mid to late 1990s, he was lauded by the West as part of a new generation of African leaders. His presidency has included involvement in the civil war in the Democratic Republic of Congo, and other conflicts in the Great Lakes region, as well as the civil war against the Lord's Resistance Army. Uganda is a republic in which the president, who is both chief of state and head of government, is elected to serve a five-year term. The unicameral National Assembly comprises 332 members, of which 215 are elected by popular vote, 104 are nominated by legally established special interest groups [women 79, army 10, disabled five, youth five, labor five], as well as 13 ex officio members, all to serve five-year terms. 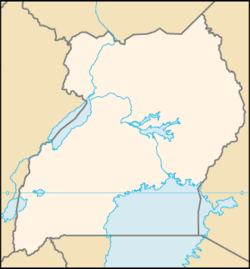 The Kampala district is one of Uganda's 80 districts across four administrative regions. Most districts are named after their main commercial and administrative towns. Each district is further divided into sub-districts, counties, sub-counties, parishes, and villages. The head elected official in a district is the Chairperson of the Local Council. The city is divided into five boroughs—Central, Kawempe, Makindye, Nakawa, and Rubaga—that oversee local planning. 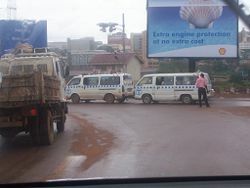 Taxis causing traffic back-ups in downtown Kampala. Uganda has substantial natural resources, including fertile soils, regular rainfall, and sizable mineral deposits of copper, cobalt, gold, and other minerals. Agriculture is the most important sector of the economy, employing over 80 percent of the work force. Coffee accounts for the bulk of export revenues. Uganda's per capita GDP was estimated at $1000 in 2007. Kampala is located in Uganda's most prosperous agricultural section, and exports coffee, cotton, tea, tobacco, and sugar. It is the chief market for the Lake Victoria region. The city has numerous food, metal-products, and furniture factories and a tractor-assembly plant. Kampala is also home to the headquarters of the East African Development Bank, and has the head offices for most of Uganda’s large firms. Uganda's roads, which are of variable quality, radiate from Kampala, although the network is sparse in the north. The city lies on the railway from Kasese to Mombasa, Kenya. 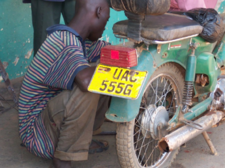 Boda-boda bicycle or motorcycle taxis are a popular mode of transport in Kampala. A bus service was planned in 2007. Port Bell is located six miles (10km) east on Lake Victoria. Entebbe International Airport is the principal international airport of Uganda, and is located near the town of Entebbe, on the shores of Lake Victoria, and about 21 miles (35km) from Kampala. Kampala had an estimated population of 1,208,544 in 2002. Limited employment outside Kampala during the 1970s and 1980s encouraged migration to the city. After the revitalization of the economy in the 1990s, most have not moved back to their home districts. The Baganda made up 16.9 percent of Uganda's population, Banyakole 9.5 percent, Basoga 8.4 percent, Bakiga 6.9 percent, Iteso 6.4 percent, Langi 6.1 percent, Acholi 4.7 percent, Bagisu 4.6 percent, Lugbara 4.2 percent, Bunyoro 2.7 percent, other 29.6 percent, according to the 2002 census. In Kampala, the Bagandamake up over 60 percent of the Greater Kampala region's population. Inter-tribal marriage in Uganda is still rare, and although many Kampala residents have been born and bred in the city they still define themselves by their tribal roots. English is the official language, taught in grade schools, used in courts of law and by most newspapers and some radio broadcasts. Ganda or Luganda are the most widely used of the Niger-Congo languages, preferred for native language publications in the capital and may be taught in school. Also used are other Niger-Congo languages, Nilo-Saharan languages, Swahili, and Arabic. In the suburbs, local languages are spoken widely alongside English, Swahili and Luganda. Roman Catholics made up 41.9 percent of the population in 2002, Protestants 42 percent, (Anglican 35.9 percent, Pentecostal 4.6 percent, Seventh Day Adventist 1.5 percent), Muslim 12.1 percent, other 3.1 percent, none 0.9 percent. Kampala has a technical institute and is the location of Makerere University, which was founded in 1922 and for many years was the only such educational institution in East Africa. Bahá'í House of Worship in Kampala. The Tombs of Buganda Kings at Kasubi is a World Heritage Site occupying 30 hectares of hillside in Kampala. The core of the site is the former palace of the Kabakas of Buganda, built in 1882 and converted into the royal burial ground in 1884. 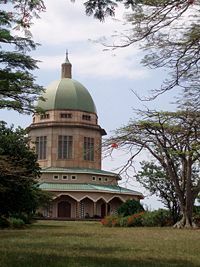 The structure serves as royal burial grounds for Mutesa I (1835-1884), Mwanga II (1867-1903), Daudi Chwa II (1896-1939), and Sir Edward Mutesa II (1924-1969). The site is noted as an example of an architectural achievement in organic materials. It is noted by UNESCO for "its intangible values of belief, spirituality, continuity and identity." 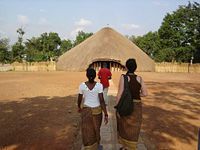 It continues to serve as a major spiritual center for the Baganda people and is the most active religious place in the kingdom. The tombs remains an important spiritual and political site for the Baganda, as well as a tourist attraction. The Ssezibwa Falls is a spiritual site where sacred black river water is found. It is a place for traditional healing and was used for royal relaxation throughout the history of the Kabakas. At the top of the falls is a bark cloth covered cave-shrine inhabited by Musoke, the god of the rainbow, who, it is believed, helps women become pregnant. The Bahá'í House of Worship, one of only seven in the world. It is known as the Mother Temple of Africa and is situated on Kikaya Hill on the outskirts of the city. The fifty acre property includes the House of Worship, extensive gardens, a guest house, and an administrative center. It was dedicated on January 13, 1961. Kasubi Tombs, a World Heritage Site in Kampala. As capital of Uganda, Kampala's peace and prosperity have advanced and receded with the fortunes of the nation. With disparate ethnic groupings within the nation, with no established pattern of intermarriage between the tribes, and lacking a democratic tradition, Uganda has a long way to go before it resembles anything like a peaceful, prosperous democracy. Genocide and war have delayed progress in this country, which has substantial natural resources, including fertile soils, regular rainfall, and sizable mineral deposits. Support from foreign countries and international agencies has aimed to rehabilitate and stabilize the economy by reforming the currency, raising producer prices on export crops, increasing prices of petroleum products, and improving civil service wages—all to dampen inflation and boost production and export earnings. ↑ New African, November 2007. ↑ 2.0 2.1 Library of Congress, Country Studies: Uganda. Retrieved December 23, 2008. ↑ Denis Ocwich, August 8, 2005, Can Uganda’s economy support more districts? The New Vision. Retrieved December 11, 2008. ↑ Humanitarian Care Uganda, CITY PROFILE: Kampala. Retrieved December 11, 2008. ↑ Kasubi Tombs Official Site, Kasubi Tombs. Retrieved December 11, 2008. African Cities.net. Kampala. Retrieved December 9, 2008. Deng, Francis Mading, and I. William Zartman. 2002. A Strategic Vision for Africa: The Kampala Movement. Washington, DC: Brookings Institution Press. ISBN 9780815702658. World Fact Book. Uganda. Retrieved September 13, 2016. This page was last modified on 13 September 2016, at 19:38.